After you have successfully installed the template as explained in the Installation Guide, we will start by setting RSAlto! 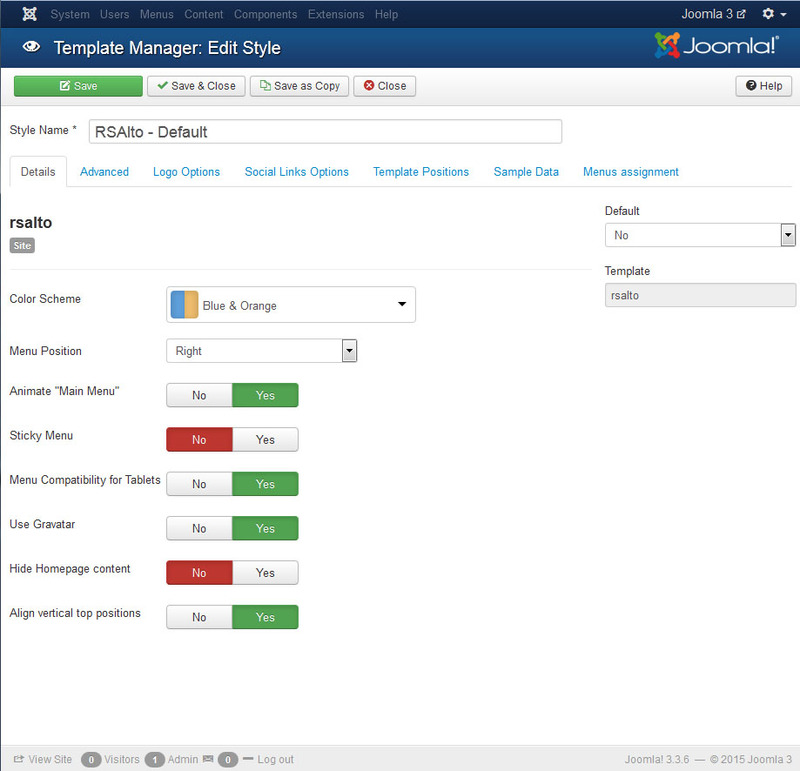 as the default frontend template. 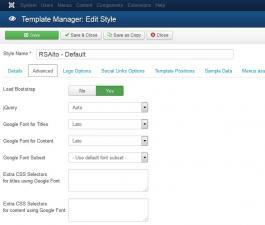 Head over to Extensions >> Template Manager >> Select RSAlto from the template list and click on the "Make Default" button. 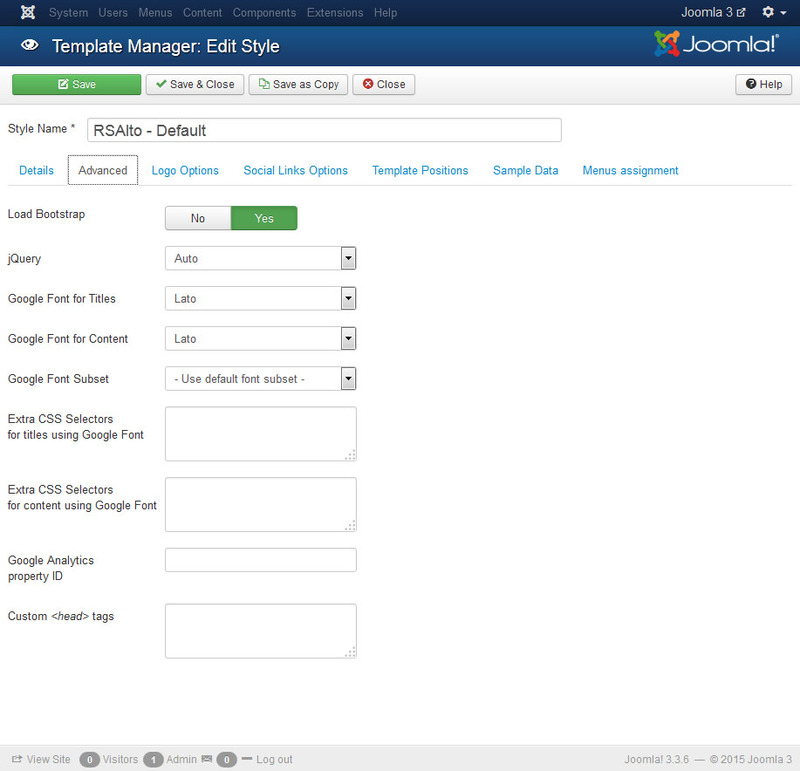 The template's configurable options can be found by going to Extensions >> Template Manager and selecting RSAlto from the style column. Color Scheme: RSAlto! comes with 20 main predefined color schemes, backed by their alternate, inverted versions, totalling 40 schemes to choose from. Pick a color that best suits your website's styling direction. Select Background: Choose one of the 10 available background images. Any combination of color scheme and background is possible. 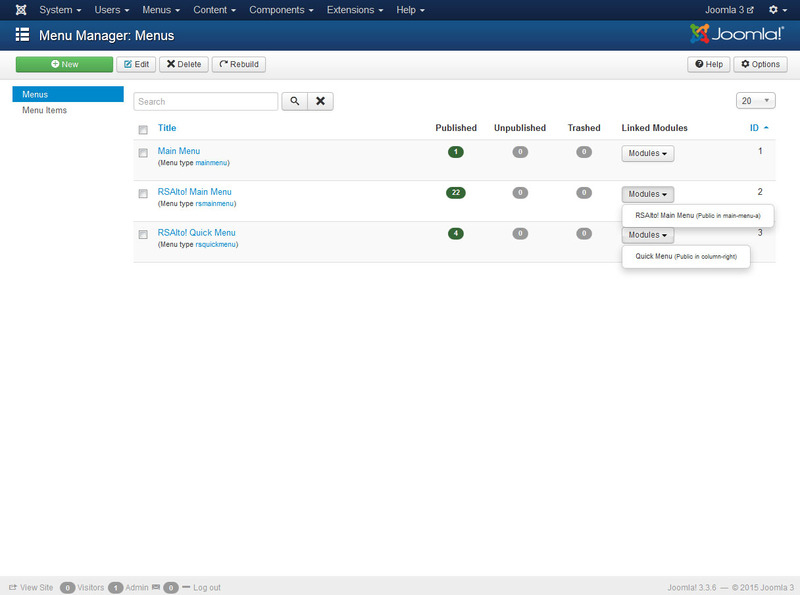 Center Menu: If set to Yes, the menu items will be displayed in the center of the module. 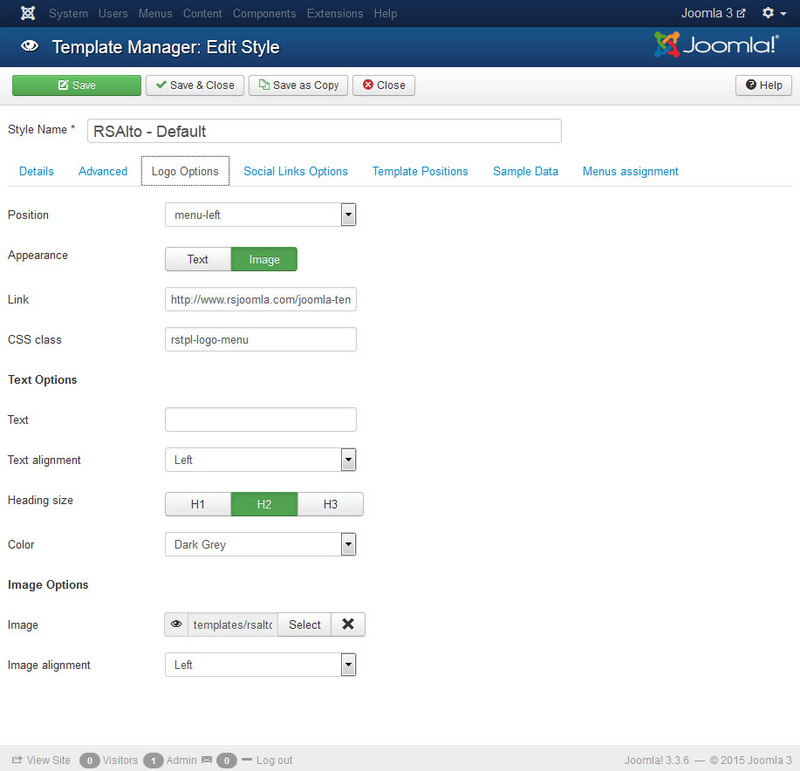 If set to No, the menu items will be displayed starting from the left side of the module. Animate "Main Menu": Enables effects in your main menu. If set to No, the menu children will appear instantly instead of having a smooth effect. Sticky Menu: If enabled, when scrolling past the menu, it will automatically become fixed to the top of the window. This will allow your users to quickly access the menu. Only available on desktop version. 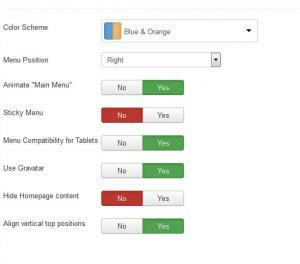 Menu Compatibility for Tablets: Enables dropdown menu compatibility with high resolution tablets (such as iPad), when being held in landscape mode. This will allow your visitors to click on submenus.. Hide Homepage content: If enabled, the home page and the column-right and column-left modules will no longer be displayed. Align vertical top positions: Aligns the Top a, b and c positions vertically. Load Bootstrap: If you are relying on another extension's Bootstrap, you can set this to No. Otherwise, Bootstrap should always be loaded with this template. jQuery: If there's another extension loading jQuery on your website you can set this to No. Google font for Titles: if selected, a Google font will replace the default font for titles. Custom <head> tags: Add the custom tags you need to the head section of the site. 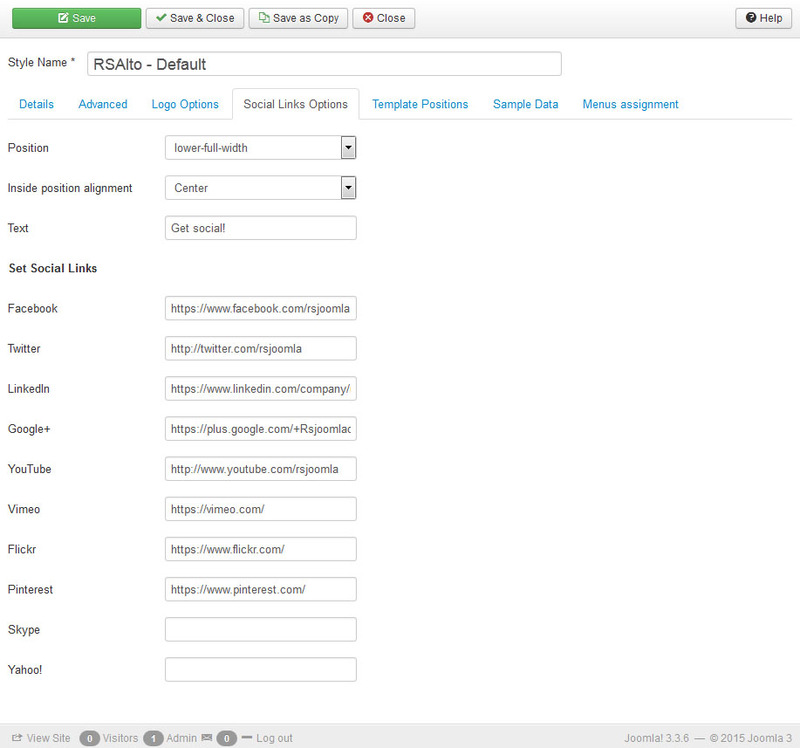 The tags you add have to be proper markup validated, otherwise the site may not be displayed well! Position: Select the position where you want your logo to appear. Please note that only top positions can be used (top-a, top-b and top-c). Appearance: Set the appearance of the logo either by Text or Image. Link: Specify a link for the logo. CSS class: You can add a custom CSS class to the logo container. Leave blank if not needed. Text: Type in your desired text, this will appear in the logo position. Text alignment: set the text alignment (left, center, right). Heading size: the heading size used for the logo text. Typically <h1> tag is a good idea. Color: Select which color you'd like to use for your text (Black, Primary, Secondary). Primary and Secondary are taken from the selected color scheme of the template. Image: select the image to be used as your logo. Image alignment: select the image alignment (left, center, right). 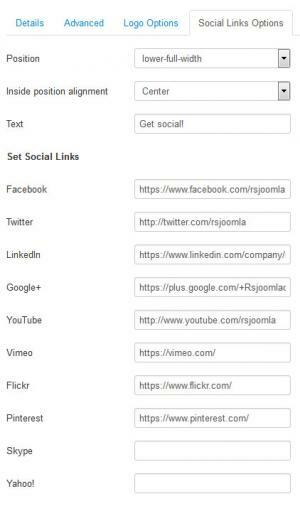 Position: Select the position where you want your social links. You can choose from one of the following: top-a, top-b, top-c, top-full-width, breadcrumbs, before-content, after-content, middle, bottom or footer. Inside position alignment: The alignment of the social links within the selected position. Selectable options are: Left, Center and Right. Text: type a name for the Social Links module. Reset to Default: By clicking on this button, your changes will be reset to the default arrangement. This tab only incorporates a single button, Install Sample Data. 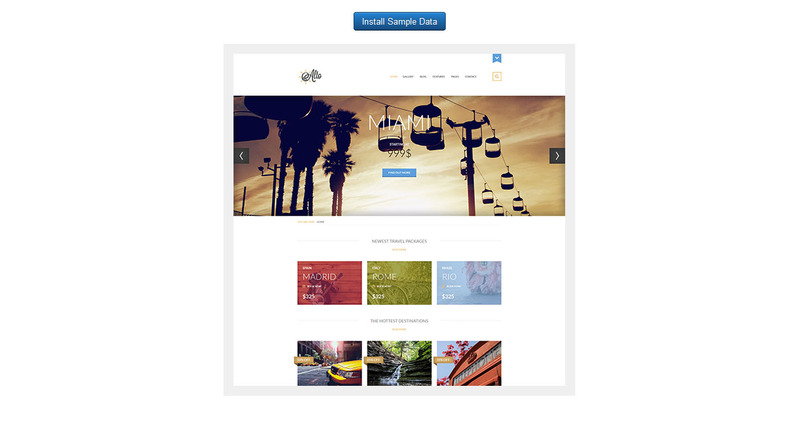 By clicking it, you will install the exact same sample data that we have included on the template's demo website. Note that this is optional, you do not necessarily need to install the sample data. 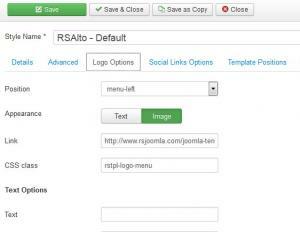 We strongly recommend to install the sample data before adding any menu items or other data on your website. For the sample data to work properly, please make sure to first install RSMediaGallery! and its Responsive Slideshow Module. The RSMediaGallery! System Plugin also needs to be installed and enabled. Go to Menus >> Menu Manager. 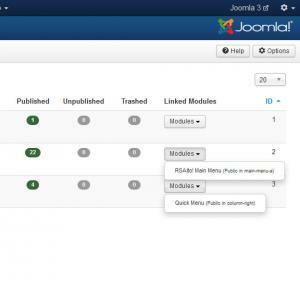 Select your main menu from the "Modules Linked" dropdown on Joomla! 3.x. Choose the main-menu RSAlto! position and the pages you want it to be displayed on(usually on all pages). 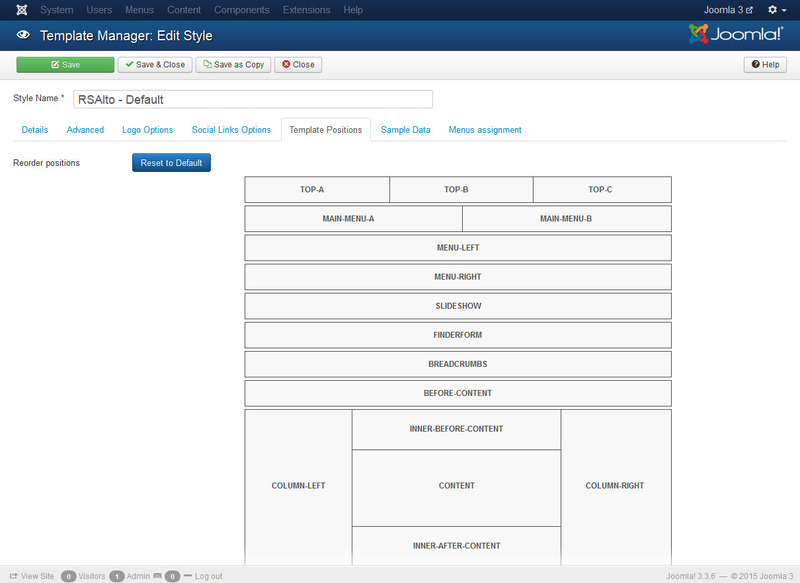 Go to Advanced Options and set Alternative Layout to responsive (from RSAlto! template). 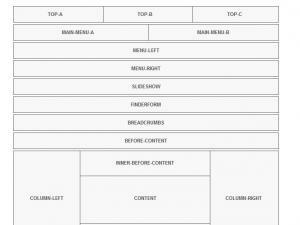 Tip: All template positions are explained in their dedicated article.